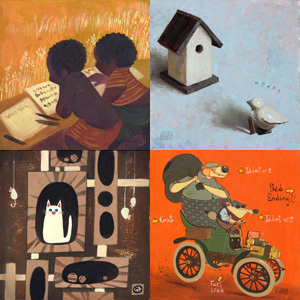 The Picture Book Project Foundation and Gallery Nucleus present Art Blocks for Ghana – a charity art auction of original works created by top artists within the animation and illustration community to provide boarding and education for orphaned children in Ghana, West Africa. 100% of the proceeds go towards the cause. The Picture Book Project Foundation is a non-profit organization that gives artists and art enthusiasts an opportunity to help and inspire children in need. Their mission is to bring continued resources and support to orphaned and underserved children around the world, while extending the talent and good will of the artist community to communities of children in need. Bids can only be placed online. Shelly Wan | "Waiting" | Oil on panel | 10" x 10"